Dr. 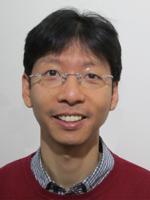 Sang Eon Han is an Associate Professor in the Department of Chemical & Biological Engineering in UNM. He earned his Ph.D. in Chemical Engineering from the University of Minnesota and his M.S. & B.S. in Chemical Engineering from Seoul National University. He was a Postdoctoral Associate in the Department of Mechanical Engineering in MIT. His current research is focused on optical and optoelectronic nanomaterials for efficient energy usage. He is a recipient of NSF Career Award in 2016; UNM Science and Technology Corporation Innovation Award in 2016; Ralph E. Powe Junior Faculty Enhancement Award in 2013; and fellowship from the Samsung Lee Kun Hee Scholarship Foundation 2003-2007.